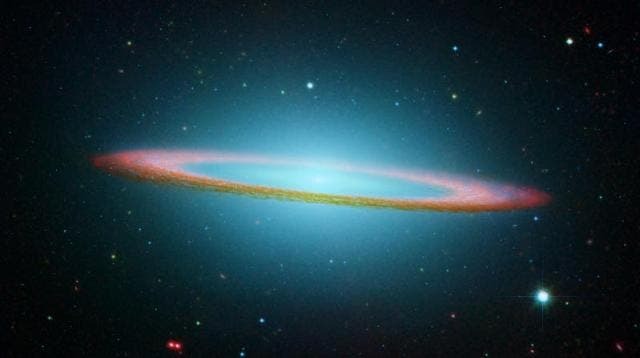 The Sombrero Galaxy –Is There a Monster Black Hole at its Core? Monster elliptical galaxies such as the Sombrero Galaxy have long been thought to form when two smaller spiral-shaped galaxies collide. They range in shapes from a flattened cigar shape to a spherical shape. They also range in size from dwarfs to supermassive giants. You will usually find elliptical galaxies near the center of galaxy clusters. The Sombrero is one of most famous of the ellipticals. Because of it’s odd shape astronomers believe that there is a supermassive black hole at the core. Now, there is an alternative theory in which a cloud of gas collapses in on itself to form a dense core of stars which then grows larger by absorbing smaller galaxies over time, which is how a massive elliptical galaxy called NGC 1407 formed according to Duncan Forbes of Swinburne University of Technology in Australia. Forbes and colleagues used the colors of the star clusters in NGC 1407 to estimate its chemical composition, and found that the concentration of heavy elements was highest at the core's center, decreasing towards its edges, which tallies with the gas cloud collapse theory because the gravity at the cloud's center would be stronger than at its edges, concentrating the heavy elements produced in stars there. The optical image below shows the giant elliptical galaxy NGC 1407 and the large population of globular clusters (small starlike objects) scattered around it. New studies of these globular clusters confirm the theory that the outer regions of this galaxy are younger, and probably the result of interactions with neighboring galaxies.